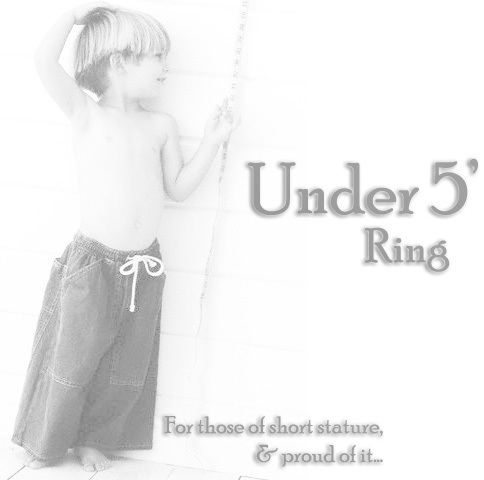 The Under 5' Ring is a webring tailored for those under 5'0" in height. I am 4'10" myself and created this ring to join all of us together that will never reach that coveted 5'-mark. The only requirements to join are that you must be under 5'0" in height and own/maintain a blogger/online journal/website. This means everyone 4'11" and under with a website/journal will be allowed. The website/journal must be "active". This isn't a diehard rule, but if your page/site goes untouched for a large amount of time, you will be sent an email asking if you would still like to be in the ring. This simply keeps dead pages from cluttering up the list. However, you will never be kicked off the ring without an email being sent first. Those that are 5'0" exactly do not qualify, I'm sorry - but be cheered by the fact that it might be the first (and possibly last) time in your life that you were too tall for something! This isn't a prejudice against people that are just at 5' - in fact you should take great pride in your height. All of us under that mark will never reach the illustrious 5 and that is the reason for the rules. Your understanding is appreciated.